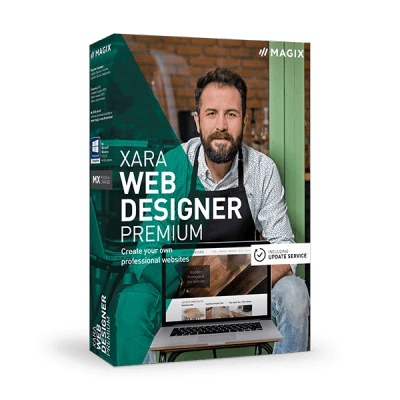 Download and test Xara Web Designer Premium for free. This innovative software solution offers a whole world of options for creating your own websites and no previous experience is required. A vast selection of powerful features enable you to design your online presence any way you can imagine. Download Xara Web Designer Premium now and take advantage of all the Premium extras, e.g. complete website templates, interactive HTML5 effects and much more. Create a professional online presence quickly and easily with Xara Web Designer Premium. Download and test this impressive software solution and enjoy all of the advantages of the Premium Version. In addition to the basic version you get all the Premium advantages that will help you make your online presence the best it can be. With Xara Web Designer Premium you can even use unique and unusual fonts for your website. Web statistics: Find out what interests your website visitors and what doesn't. With this knowledge you can improve your website and increase sales. Multimedia integration: Embed videos, music and interactive photo galleries into your website.